What does this popup mean? It means that IDE consider's include argument a dynamic expression with contents not supported by our evaluation engine and thus notifies you that this expression value is not checked. Looks like a bug in this case. Please submit a bug report. Done: http://youtrack.jetbrains.net/issue/WI-1576. It was April, 2. But today I opened project and didn't see this warning. And I don't know how to repeat it. 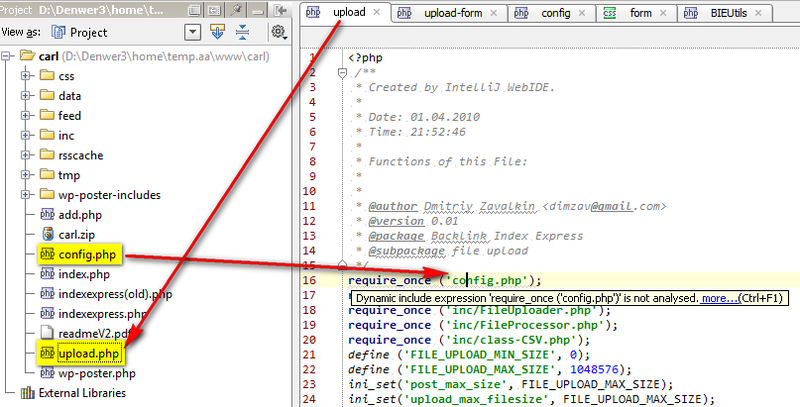 The upload.php has been created before April, 2. And it was created in PhpStorm 94.583. And April 1 or 2 I upgraded PhpStorm to 95.17. Maybe it is old cache related issue? So there is no way for phpStorm to figure out the full path. Suppressing inspections for individual statements is not available for PHP yet.